After installing the latest upgrade I'm prompted to login with my Parallels account. When I try doing so an error message shows up: "Check your Internet connection and try again. If the problem persists, follow this link to register your copy of Parallels Desktop.". The Internet connection is fine. NOTE: No symbols will be shown due to security measures, so just hit the keys and use return/Enter. Copy the output of these commands to some text file and share it with Parallels Desktop Support Team. Type in your Mac password. Launch Disk Utility application ( Applications - Utilities - Disk Utility). Select a disk in question (its name Macintosh HD by default, if the disk wasn't renamed) and then click on First Aid button. Once suggested by the application, press Run button to start the process of verification and repair. Press Continue button to proceed. 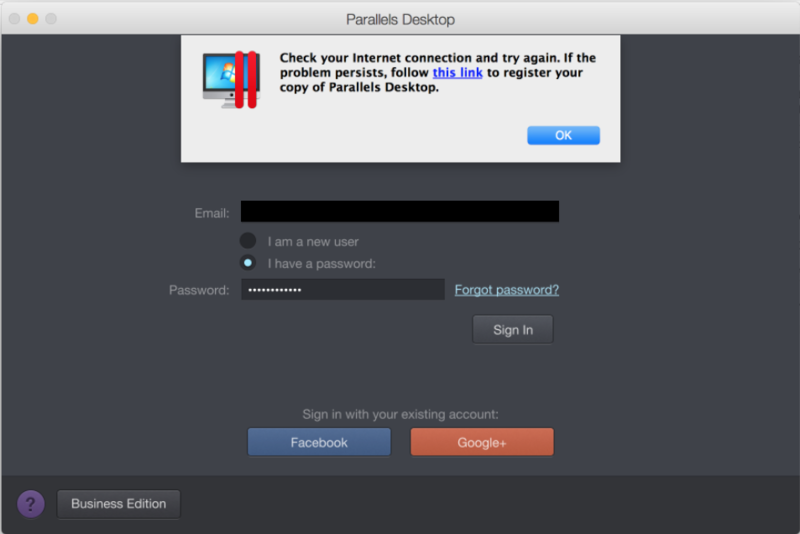 Start Parallels Desktop and try to login again using corresponding credentials. If this solution does not help, contact Parallels Desktop Support Team.